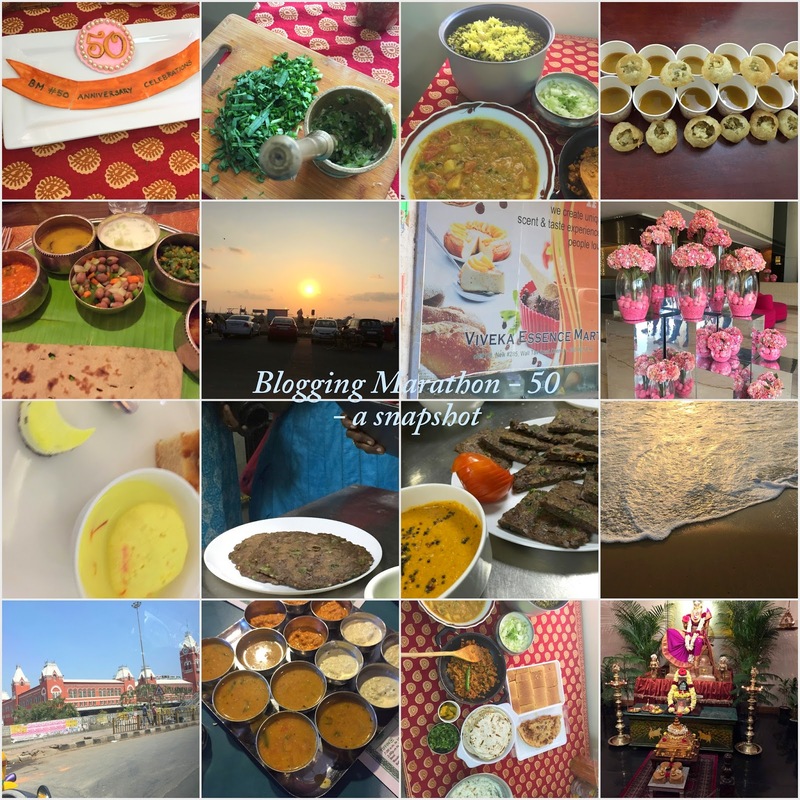 Having been part of the 50th Blogging marathon in person was an experience worth sharing. There are a lot of us BMers who would post this event in their blogs day by day, and event by event pics for all of us on the blogging marathon family circle : a family that Srivalli led by the front. My post here is providing a different perspective that I personally experienced and at close quarters. The much awaited BM 50 (Blogging Marathon) meet just concluded on Sunday, and boy it was fun ! 50 months of non stop cooking, non stop emails and non stop chatting : All this while I had been chatting to people who are so much a part of ur social ecosystem, and putting a face to that name was exciting, fun and exhilarating. Late night chats, some of the foodies in us going into OCD levels of clicking each moment, each prop and vying to neck out and see that demo, video shoots,pani puri shots, cake carving, food studio visits : all of this was so much fun. For me, it was more interesting to see the personal & emotional angle where Padma as the too-perfect hostess made sure we were completely comfortable in her house that we usurped , and Veena, who led logistical and emotional support throughout the event. Of course Princy (vaishali) was driven crazy by the tamil-speaking girls who giggled when she wandered in with a (invisible) stick and threatened to fine us if we spoke in our native language. As the quote by Henri Nouwen (above) goes, it isn't easy to open your doors and heart to (almost) complete strangers : strangers whom you would have never met otherwise or given a second glance if you had met them at the market or an airport. It takes guts and strength to arrange and successfully complete this kind of event, and kudos to all the South bloggers (Padma, Kamalika, Valli, PJ, Veena, Gayatri, Nandini) who arranged every detail with so much passion it was exhilarating. Pradnya, Usha, Archana and Vaishali provided so much fun and laughter its impossible to record them through words. Although I missed some crucial parts like meeting the bloggers' personal family / kin and a few key events , it was warm all along, and thanks to Padma who didn't lose her composure any moment with almost rowdy-like hilarious momagers(moms who acted like teenagers) who had all-but hijacked her house and the two lil adorable kids who accompanied us on all our outings during the trip. It showed no matter how far or near you live, LOVE is one thing that binds the world. So, here's signing off from BM 50 as I leave you with a picture collage, and looking forward to BM75 (about 2 yrs from now) where some of us (shhh) have some ideas already brimming! PS: due to personal privacy and respect to the other bloggers, have put up a collage with food and food related pics (without tagging any person on pics). The rest shall be shared privately. Thanks friends for all your entries on the anniversary giveaway, and a big thanks for your continued support and wishes... The lucky winner chosen randomly is Sandhya Ramakrishnan ! Congrats to the winner. I shall be contacting Sandhya separately, and need an India billing address for shipping. Chaat is welcome in any form at my place. I had a batch of cooked and frozen chickpeas, and when my elder girl asked me to make something chatpata (spicy) on a rather chilly Sunday afternoon, I suggested that I make this. 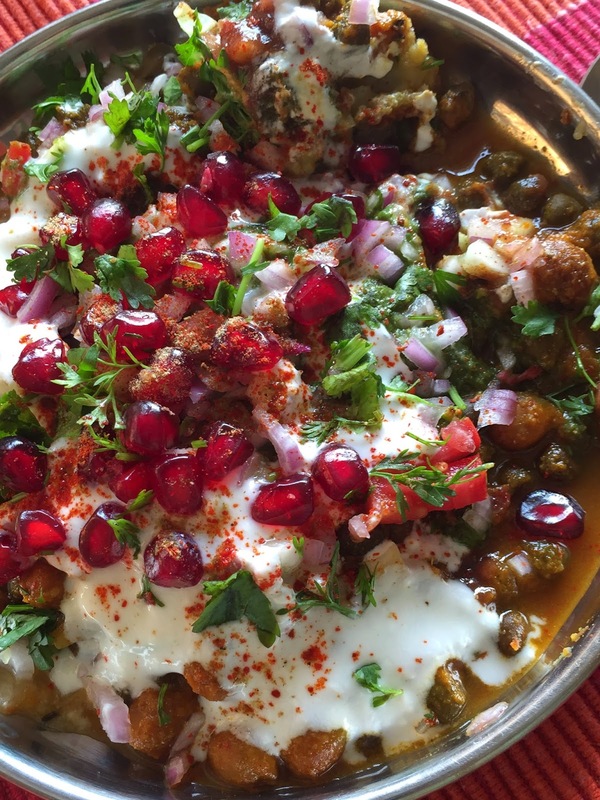 She was more than eager to help me assemble the chaat, and thanks to inspiration from Vaishali who had posted a similar post that morning, we enjoyed making it and wolfing them down. 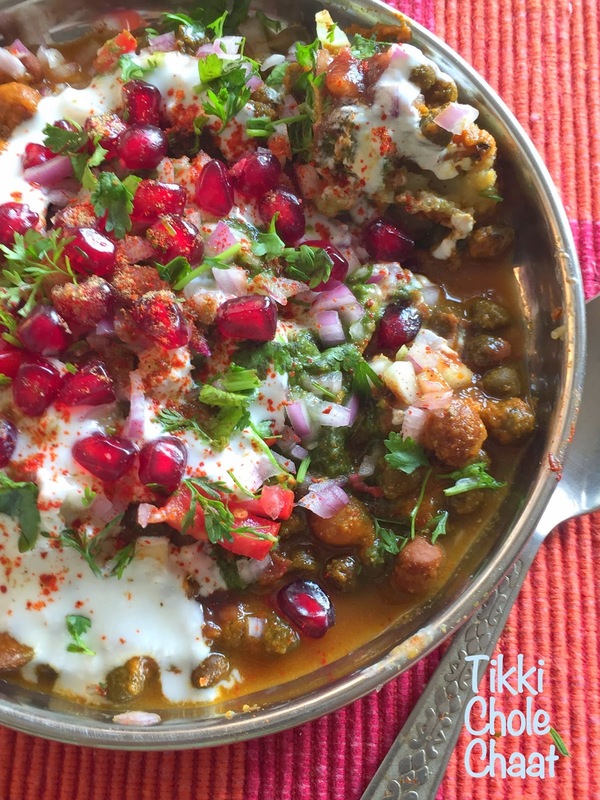 Although slightly tedious, this is very similar to the Ragda patties or the Dry Tikki Chaat. The base instead of dried peas gravy is similar to the Chole (chickpeas gravy) served with Puri or Bhature. Topped with sev , chutneys and a dash of yoghurt, this makes for a lipsmacking and colourful chaat for any party or get together. Chole: Follow this method to make Chole. If you have cooked / canned chickpeas, drain and make the usual recipe with Chole. Let the gravy be little dry and not too runny. 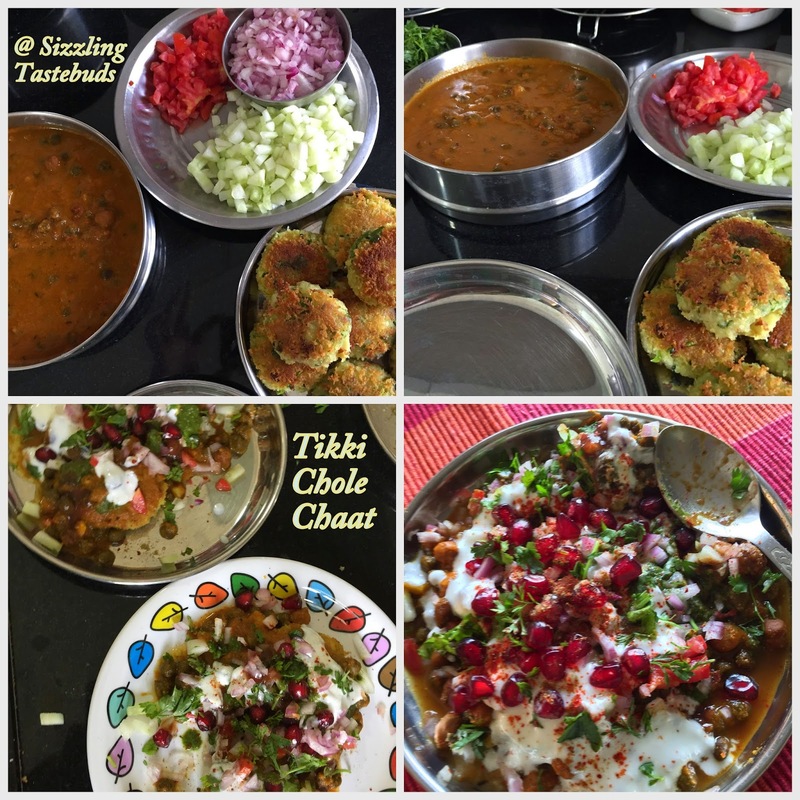 To make the tikki, mix all the ingredients under Tikki list and make into tikkis. If not making immediately, refrigerate for upto 12 hours. Else blast freeze for 10 mins to make them firm. Shallow fry in oil and drain on paper tissues. Take 2 tikkis per serving, mash them up slightly. Add a ladle full of prepared chole. Top with chopped onions, tomatoes, a dash of yoghurt and all the chutneys and toppings. Add sev and serve immediately. Soups are sought after by my elder one. She loves a variety of soups, although Toor dal- Carrot Soup is her favourite. I generally make it on weekends when she can enjoy this. Today's soup is a quick to make & calcium rich Palak Almond Soup that I made for her post school-its not only filling but very healthy too. Hope you enjoy this colourful hearty soup during winters, when Spinach is available in abundance. You can use fresh or frozen, regular or baby spinach. As I have access to fresh spinach through the year, we make this regularly. Addition of broccoli is optional, but I added this to have a bite. 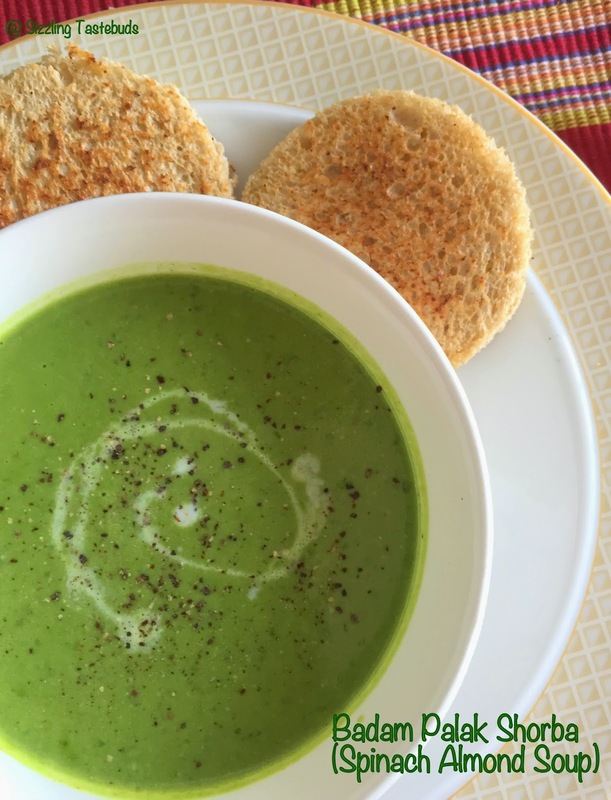 LLinking this to Archana’s Soups and Salads Kids Delight event , created by Srivalli. 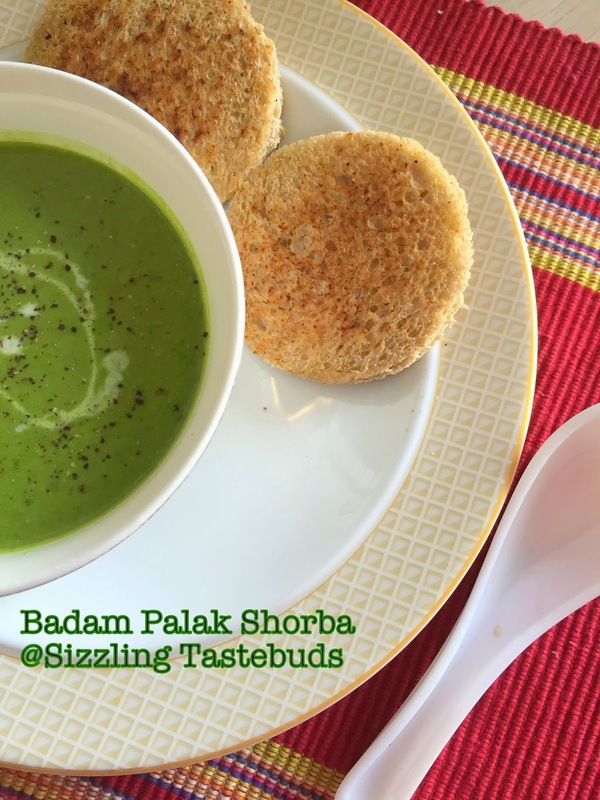 Palak Almond soup with Broccoli. *In place of almond meal, simply blanch, dry and powder coarsely a handful of almonds. I soaked them for 30 mins, and pureed them along with the skin on. In a pan, add half the butter / oil. saute the garlic and onions for 4-5 mins till they soften a bit. Remove. In the same oil, saute spinach for 1-2 mins without any water till it wilts a bit. Remove and cool. Add the remaining oil and saute the washed and drained broccoli for 3-4 mins till slightly sauteed but still crunchy. In a blender, puree spinach, onions, garlic to a fine puree. Add almond meal and puree once more, but not too much. Return this puree to the pan, let it simmer along with the broccoli. Add milk , salt and pepper as desired. Check for spice and salt. Once creamy, transfer to a serving bowl. finish with cream and top with pepper if required. 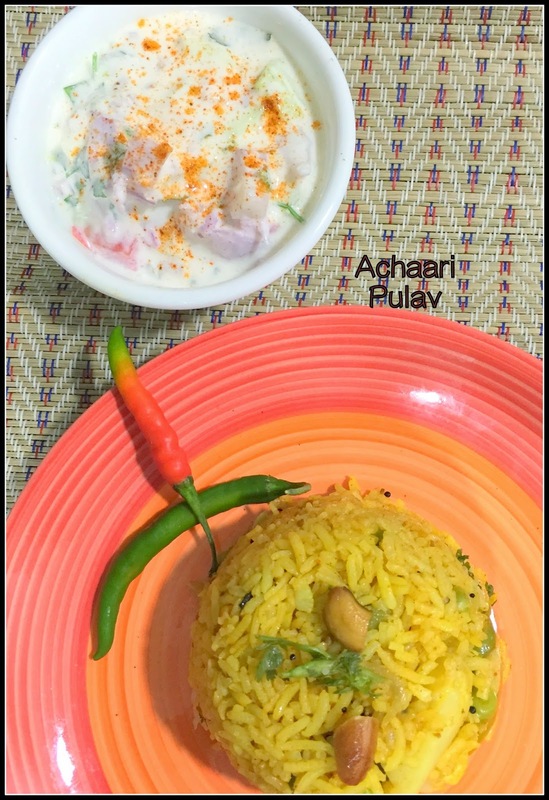 This week, via Blogging Marathon # 49, we take you through colourful kids dishes. They say we eat with our eyes, and this is more than true for kids - even the most boring vegetable / fruit can be fed to kids if they are packaged well. First in this series are these cute Hung Curd Canapes - a great pick-me-ups for parties and potlucks. The fillings can be endless, but as am a real fan of hung curd for parties, made these for a quick get together we had last week. What's more - this is a Zero - Cook dishes, which would be great to have for a busy weekend party, right ? I made this dish once with onions and garlic and once without. We liked both versions. Do add onions if you prefer. If you have a rice cooker, this can be made for a weekend meal within 20-25 mins if you are prepped a bit. So enjoy this with plain curd or a onion / cucumber raita. 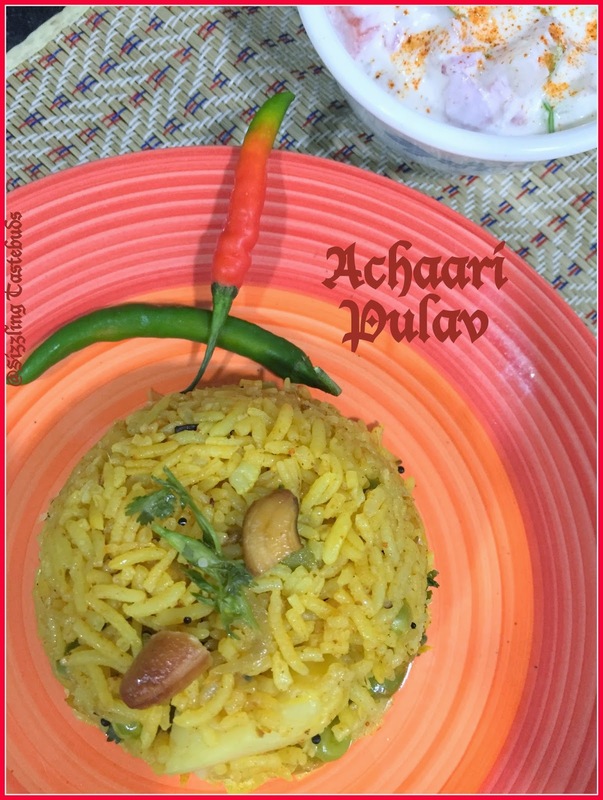 Achaari Pulav – a one pot meal with vegetables and a pickle base. Course - Indian, Course : Mains / Rice variant. Ingredients: (Am repeating verbatim the recipe that my cousin gave me). Chop the potatoes,carrots lengthwise.Blend the mango pickle in a blender into a coarse paste and keep aside.In a pressure cooker,heat the oil,crackle the cumin seeds,. Add the ginger garlic paste,turmeric and saute until the raw flavor is lost.Add in ground pickle paste and saute well and let it cook for 2 mins. Slowly add in all the vegetables and mix well and cook for few minutes till the pickle coats the veggies well.Adjust salt and spice level as per taste.Add the rice mix well and pour in the boiling water and pressure cook for 2 whistles. Let the pressure subside naturally and then after releasing fluff the rice with a fork. Garnish with roasted cashewnuts and corriander and serve hot with raita of your choice. A quick bachelor fix – Dosa. 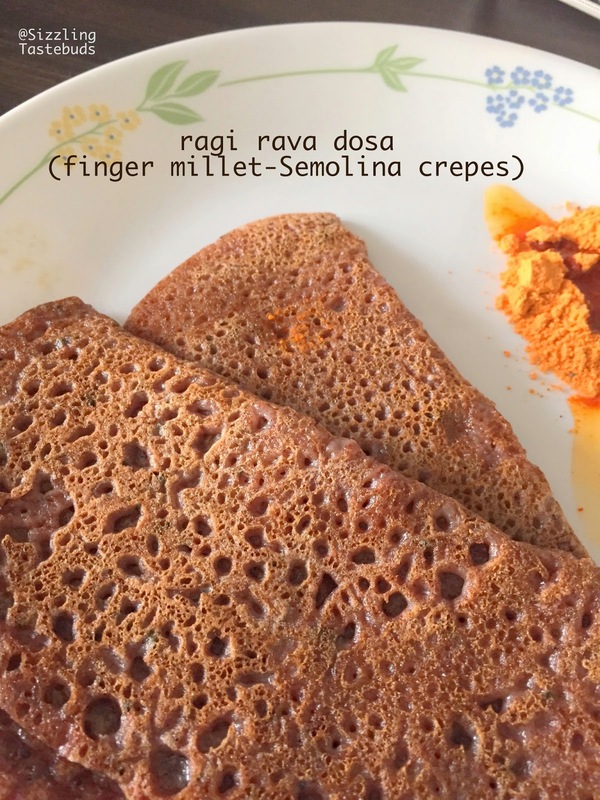 There are thousands of varieties of dosa- both fermented and instant like Wholewheat dosa, Brown Rice Dosa, Ulundu Dosa, Cornmeal Dosa ,Set Dosa etc. But while cooking for oneself, time is a premium. So, today’s dosa is an instant version - and can be had for both breakfast or a quick brunch. We had it for a Sunday lunch along with Avial for a filling meal. Tastes best with Idli/Dosa Molagapudi (spiced lentil powder). Hope you like the series this week. Type : Breakfast, Cuisine : South Indian, Can be made vegan if required. Sieve the flours with salt. Add rava, green chillies, hing and mix well. Slowly add sour buttermilk in batches till you get a dropping waterish consistency , free of lumps. Keep the batter aside for 10 mins. Heat a non stick tava and slightly grease with oil.